Pinnacle continues its march through the historic district and landmarks in Delaware. (see our post on the Josephine Fountain) We are proud to help our hometown renovate and refurbish these incredible statues and edifices. We pride ourselves in being the very best at getting crews access to historic structures without leaving a trace – and this statue is no different. Located in the heart of downtown Wilmington, DE (Rodney Square) stands a statue to Caesar Rodney, an American lawyer, politician, signer of the Declaration of Independence and President of Delaware during most of the American Revolution. The monument commemorates Rodney’s ride from Dover to Philadelphia on July 1-2, 1776 to cast a tie-breaking vote for the Delaware delegation, and thus ensuring Delaware’s support of the Declaration of Independence. And around that statue is scaffolding erected by Pinnacle Scaffold, also from Delaware, to help crews get access to the entire statue for renovations. The statue was created by James E. Kelly and stands in the front of the square. Our crew took the utmost care to design, deliver, erect scaffolding that would allow renovation crews the ability to refurbish the base, (repointing, cleaning), shining and polishing the statue and bringing the monument back to its former glory. We also added debris netting for containment while the guys did their work. As I’ve said before, we love working on historic projects and are proud to lend our support to this prestigious one. 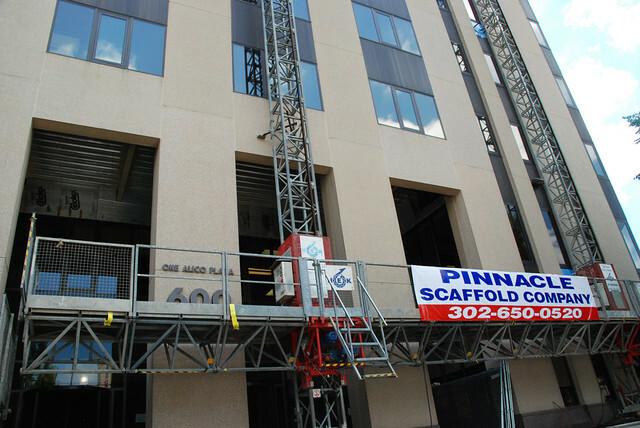 If you need access, scaffolding, or lifts call Tony P at Pinnacle Scaffold today (302) 766-5322 or visit www.pinnaclescaffold.com to see more of our work. More on Rodney square: Rodney Square presently includes green space with landscaped borders, paved, perimeter walkways, cast stone walls, stairs and balustrades, and 12 bronze lanterns. Two concrete fountains flanking the west steps serve as a memorial to William Poole (1853-1918), a descendant of an early Quaker family and former head of the Wilmington Fountain Society. The well-known feature at Brandywine Park in Wilmington, DE has been taken out of operation and is undergoing a major restoration project. The Josephine Fountain, which was dedicated in 1933 and named after the late wife of Attorney Joshua Ernest Smith, has sustained significant structural damage after severely cold weather in the winter months. 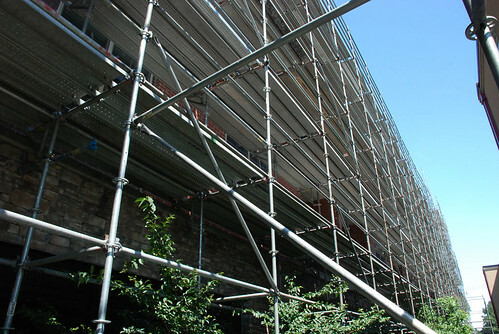 Pinnacle Scaffold was brought in to aid in the restoration process because of our flawless track record dealing with historic buildings, statues and artifacts. 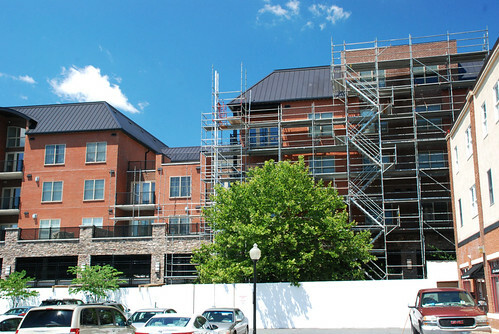 It takes a scaffolding company like Pinnacle to make sure the project is done right and everything remains the way we found it. 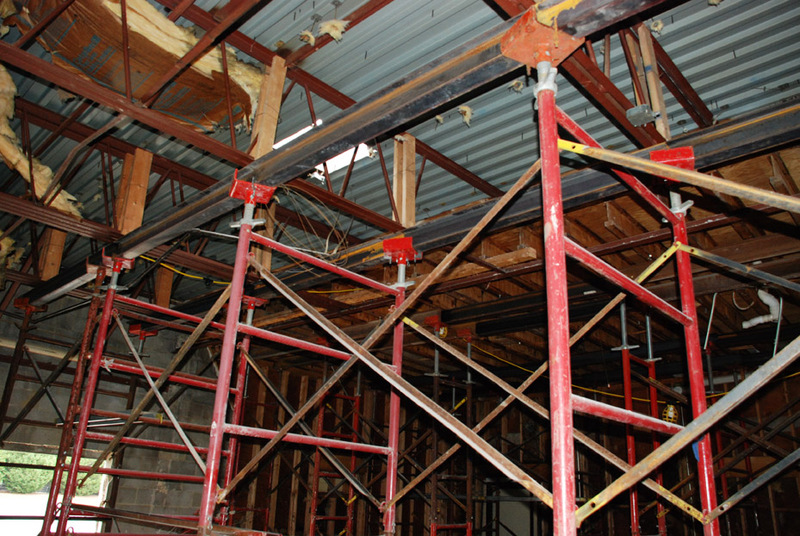 Here you can see the scaffolding we erected to get the renovation crew to their designated elevation. 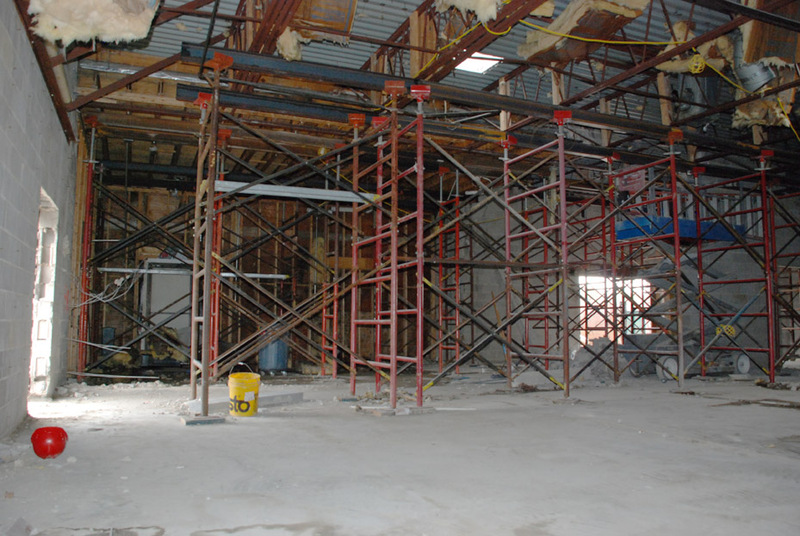 We used system scaffold and decked it in on 3 levels (where the crew will dismantle the statue). We took the utmost care while assembling to make sure nothing was harmed. The park brought in surveyors who discovered it needed critical restoration work. 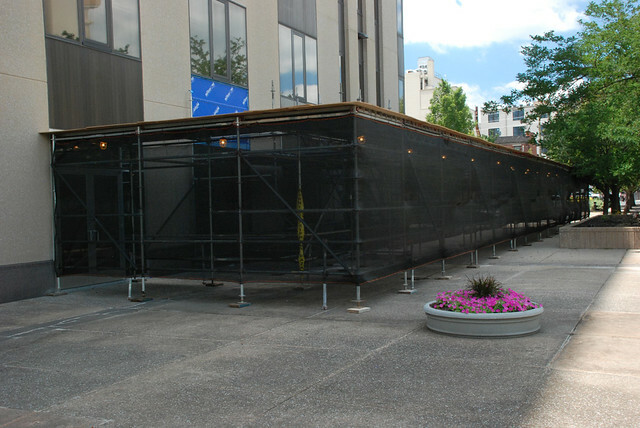 The work will require the statue and fountain to be disassembled and temporarily located off-site for the work the commence. It should be completed by summer of 2017 when it will be brought back to it’s original glory. We love working on historic objects and are proud to lend our support to this prestigious project. 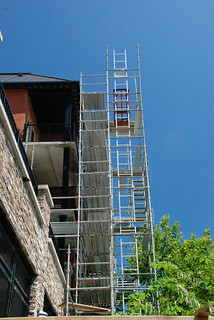 If you need access, scaffold or lifts call Tony at Pinnacle Scaffold today (302) 766-5322 or visit www.pinnaclescaffold.com. And since this beauty is going to be down for a little while we thought we’d play this little ditty for ya. 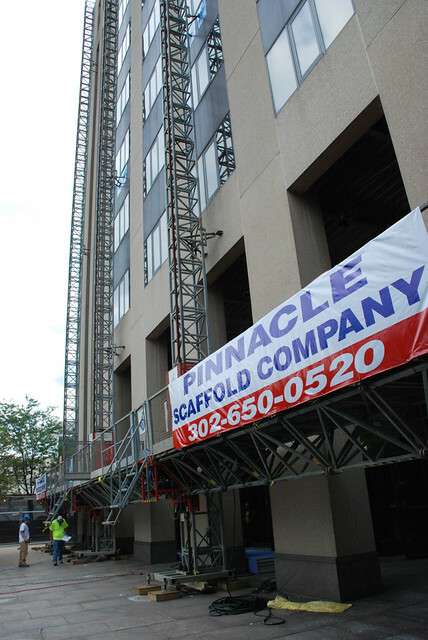 Pinnacle Scaffold is on the front page of the Delaware Daily News Journal! It’s always a welcome treat when you get a news story in a publication but it’s especially tasty when you land on the front page of the newspaper! 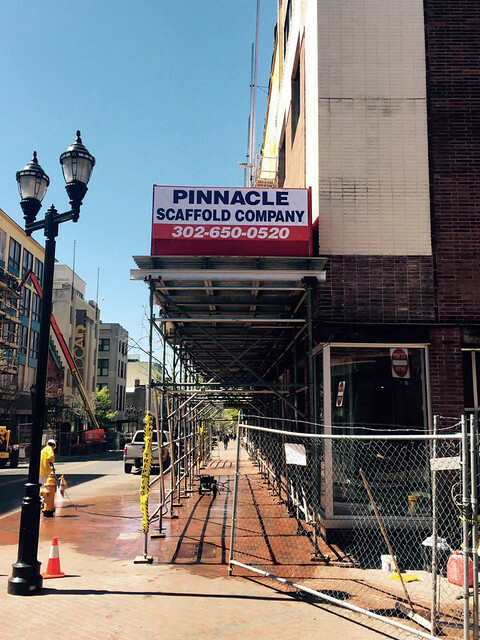 Granted, this isn’t a story about how Pinnacle Scaffold is setting the world on fire with it’s scaffolding projects but none-the-less it’s a great story about revitalizing the downtown Wilmington area and it features one of our jobs. And furthermore, if you zoom into the right corner of the photo you will see our banner in full glory atop of the scaffold at 627 N. Market St. Thanks to the Delaware News Journal for the great article and photo. 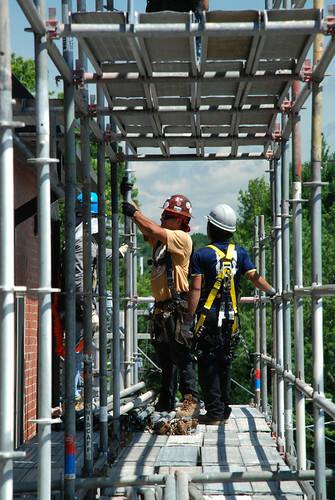 For all of your scaffold, scaffolding, shoring and mast climber needs call Tony P at (302) 766-5322. 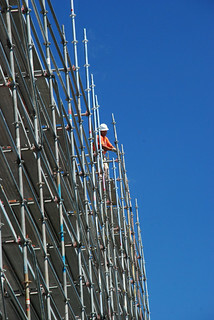 Visit www.pinnaclescaffold.com for more information and past jobs. 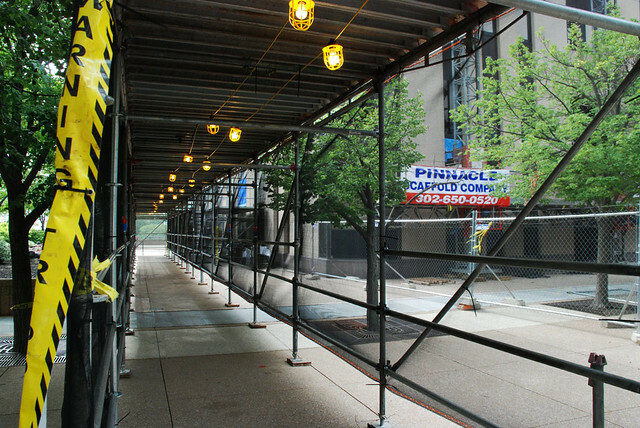 Peepin’ – Hidin’ – Scaffolding Anyway You Want it. There are certain jobs that scream – LOOK AT ME and there are ones that kind of creep up on you – like this job at 113 E. Main St., Newark, DE. Let’s start with the canopy first. 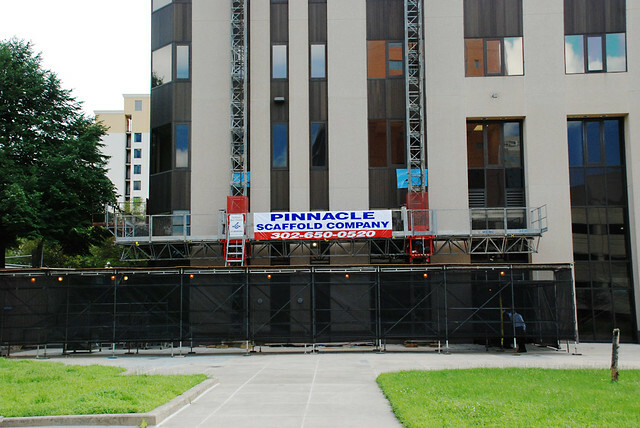 Pinnacle is a master of crafting functional yet attractive overhead protection systems for their clients. 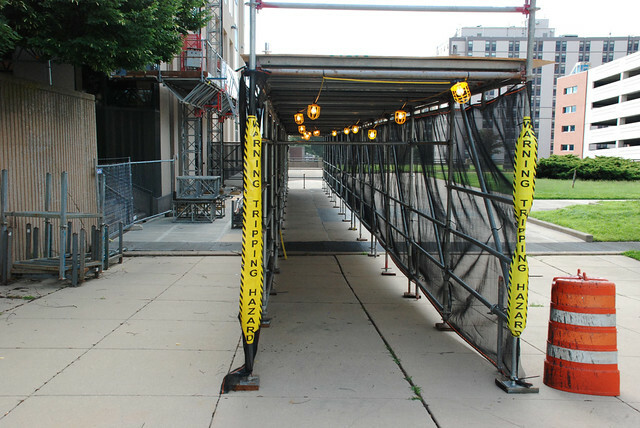 Safety for pedestrians is our main concern while the construction, renovation or masonry work goes on overhead. And this system canopy was no different. 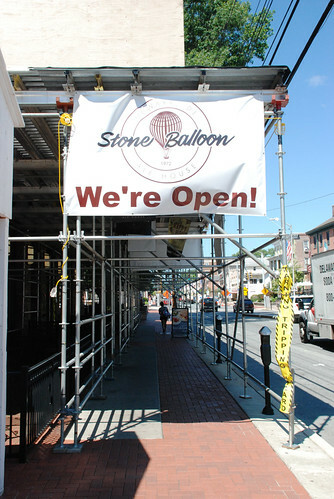 It allowed the Stone Balloon Ale House and all of the other businesses out front to remain open while façade work goes on around the building. 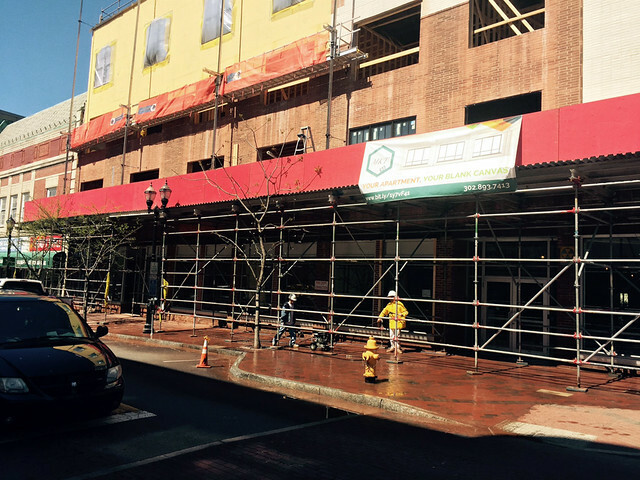 This custom sized canopy protects the patrons on the patio, the tenants as they go about their daily routine and the pedestrians who pass by. And best of all it looks great like it could have been designed into the original architecture. Okay – maybe not that good. And then you have the “creep” factor on the rest of this job. 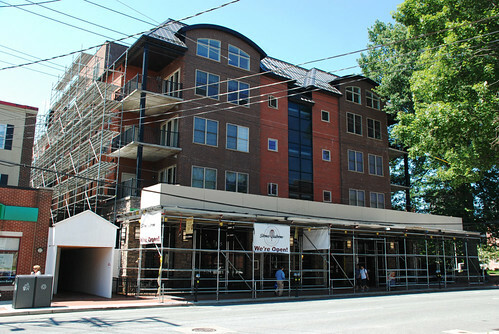 It just kind of creeps up on you but behind the front of the building lays a very large scaffolding job. 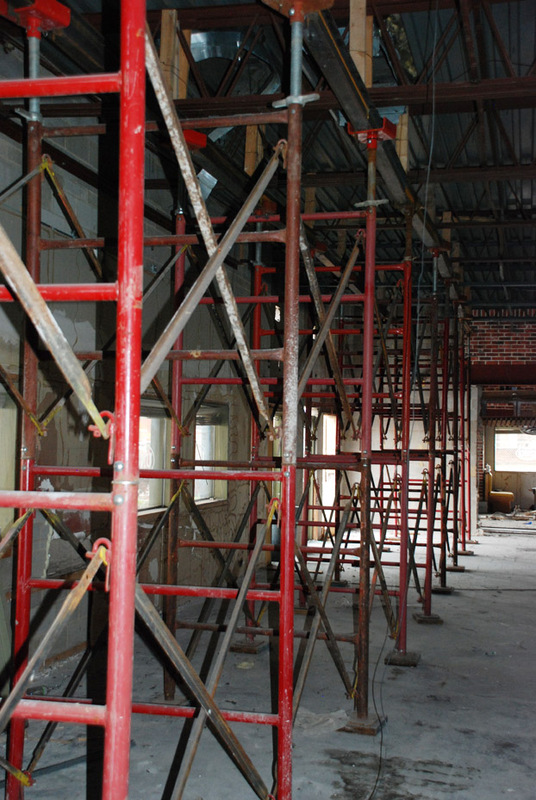 Hidden back there is a 60’ tall X 200’ long (800 lineal foot) scaffold that will allow restoration and masonry crews complete access to each floor and every inch of the façade. 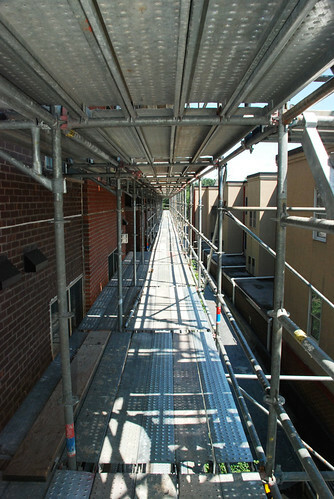 This 6 story system scaffold sits on the ground next to the walkway that spans between the two buildings. It’s a very busy complex and area with the University of Delaware students traveling to and fro. 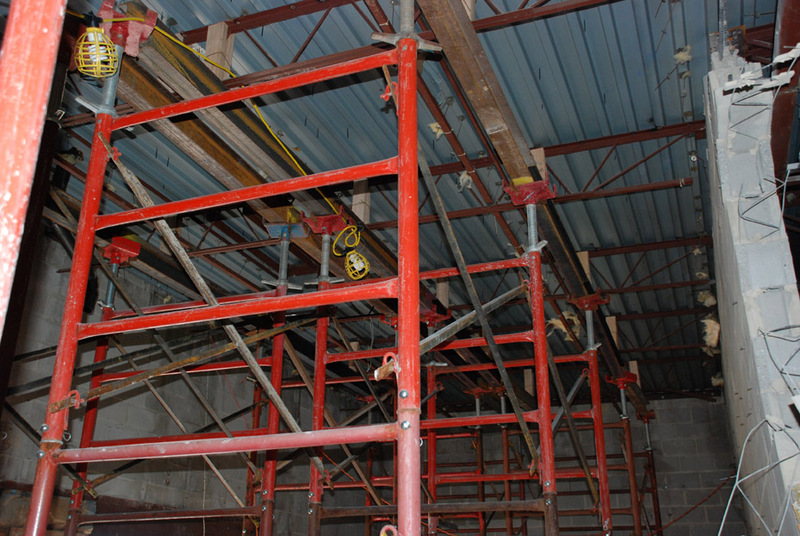 We also have a Beta Track material hoist that helps get equipment to the crew safely and efficiently. 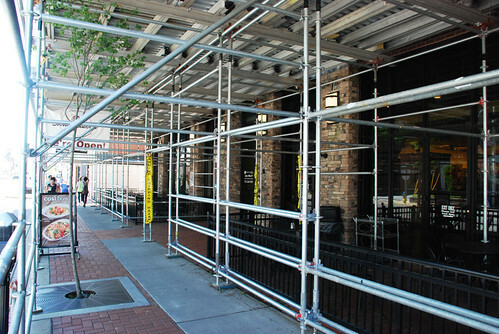 The entire scaffold will be wrapped in debris netting to further protect the pedestrians and tenants. Trash chutes will be added to help move debris from each floor to the ground level receptacles. 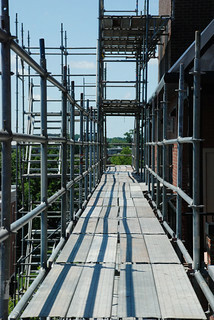 These photos and video were shot as the scaffold was being erected so there is more to come. I’ll try to update it with additional pics. 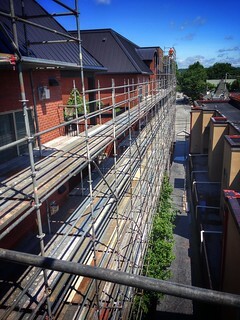 The job is being done in phases so as one section finishes crews will move the scaffolding around to the next section. And that’s a lot of scaffolding. So the next time you’re a bopping around town and you see a cool overhead protection system out front of an establishment you might want to peek around the side to see if there is anything else going on. It might just surprise you. 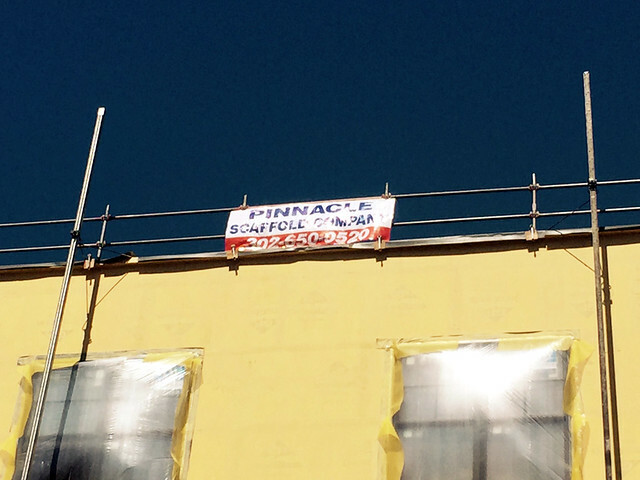 If you need scaffolding for a masonry, painting, construction etc., call Pinnacle Scaffold today at (302) 766-5322 and ask for Tony P, or visit www.pinnaclescaffold.com to get more information. Here’s a video of what’s hiding on the side of the building. And for your listening and viewing pleasure, The King – Elvis with Baby, What You Want Me to do. 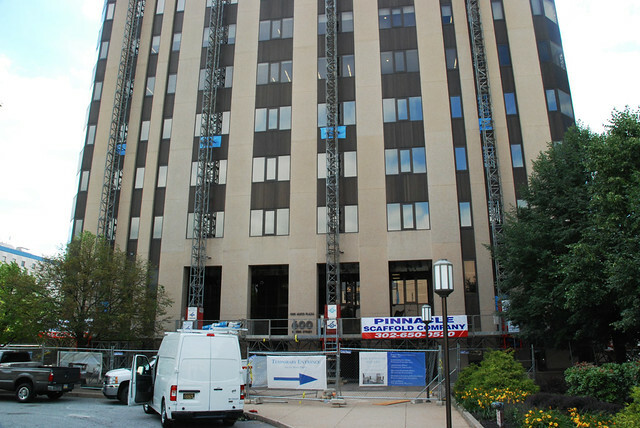 Pinnacle Scaffold is providing mast climbers and overhead protection for the renovation of the AIG, Alico (now MetLife) Building at 600 N. King street in Wilmington, DE. 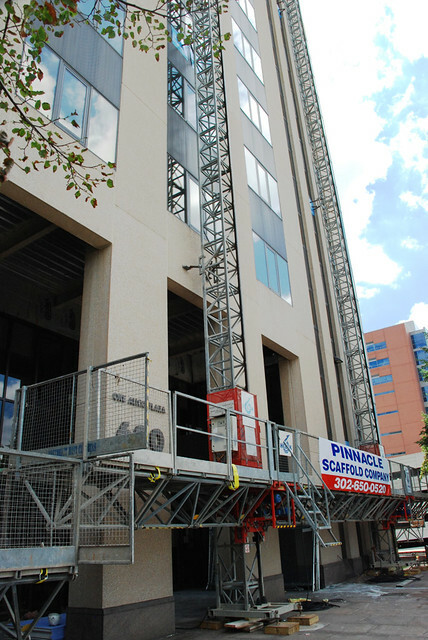 The building is in the middle of a major renovation including a new lobby, elevators, mechanical and system upgrades as well as a major façade improvements – and that’s where Pinnacle comes in. 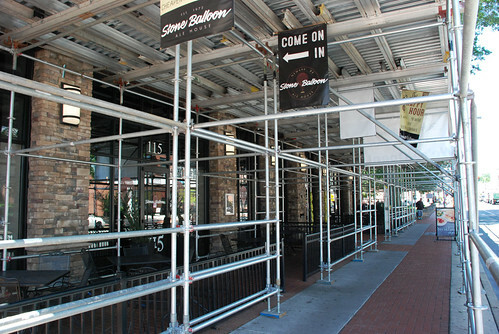 We are providing 3 twin mast climbers that will work on all 4 sides of the building. 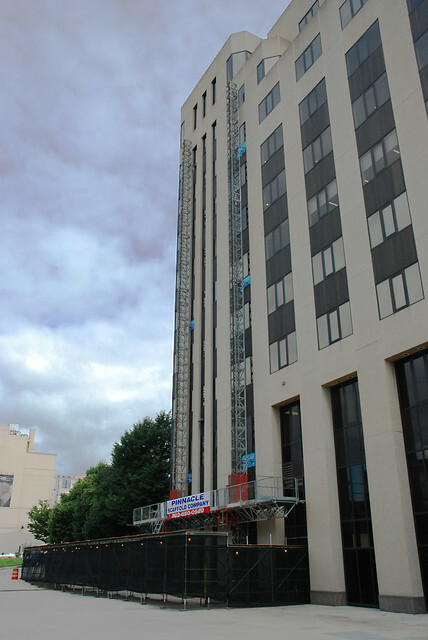 They are renovating in phases so the mast climbers will move to opposite sides of the building once the work on the current side is complete. 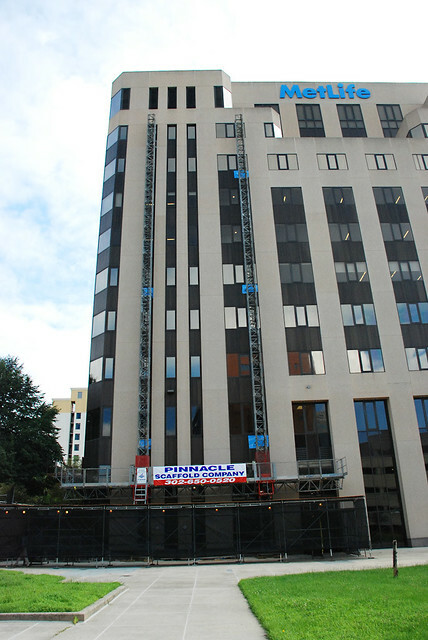 Crews are cleaning, re-caulking and replacing windows and metal panels. 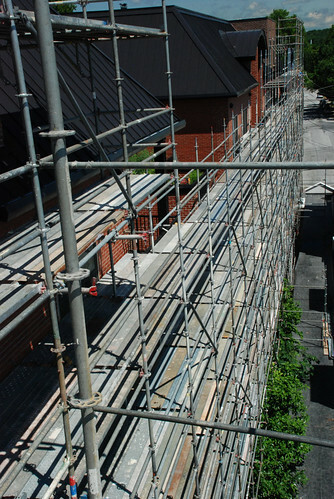 Using mast climbers can be a good, cost effective alternative to traditional scaffolding, especially when working from the ground up and multiple trips are needed. These twin mast climbing units run at about 35 feet per minute. On the surface this looks like a typical mast climber job but it’s far from it. What you don’t see are the shoring towers beneath each mast climber base platform to distribute the weight of the base units and towers down through the 4 story parking garage that sits underneath the structure. 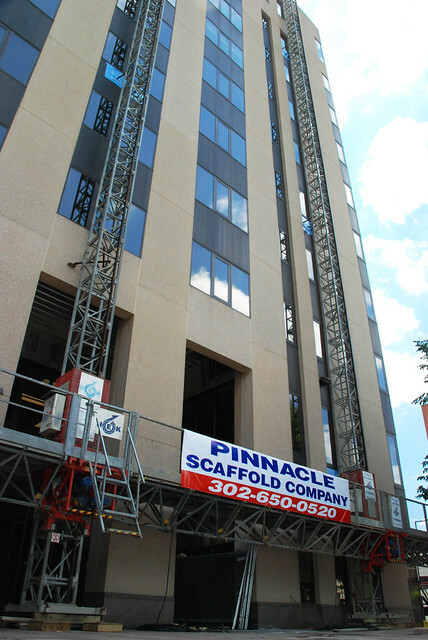 Pinnacle also provided overhead protection systems on the north and south sides of the building for customer access to the high rise while the façade renovation takes place. 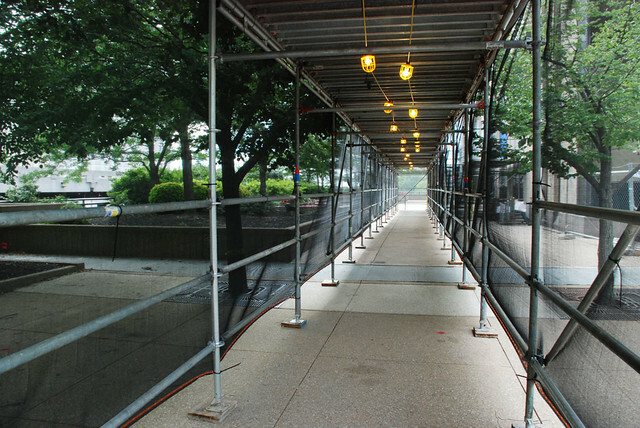 These canopies use system scaffold and are wrapped in debris netting for added protection. This will be a 4-6 month renovation project working with Wohlsen construction. PSC is proud to be working with them and the other companies on this project. 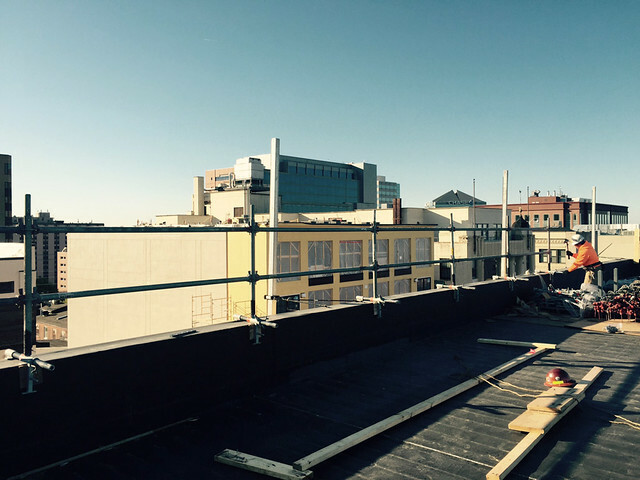 600 N. King Street is ideally situated in the heart of downtown Wilmington. It is just blocks from the Wilmington Amtrak Station, various Riverfront attractions and the New Castle County Courthouse. 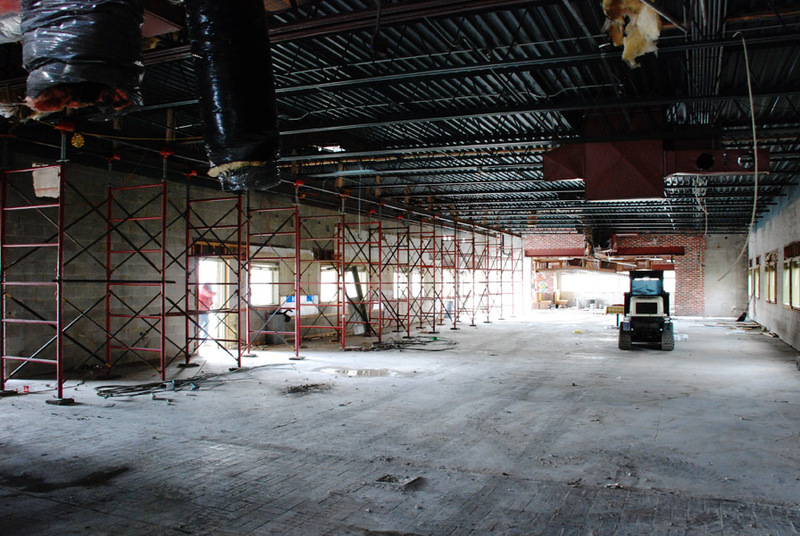 It features an on-site future café and covered parking beneath the building. 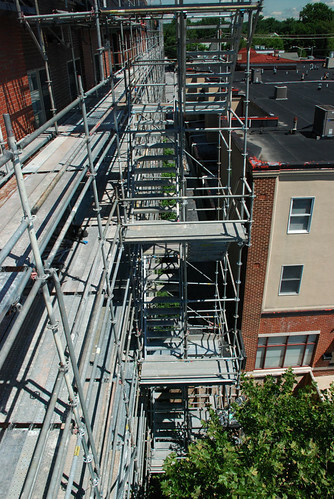 Pinnacle Scaffold provides scaffolding to the Holy Trinity Greek Orthodox Chuch at 808 N. Broom St., in Wilmington, DE. And this really struck a chord with us at Pinnacle. By being early pioneers in the business and not being afraid to work and take almost any job to establish a great reputation in a growing region has been our mantra. We can only hope to achieve a modicum of the success that the Greek Community has. We were pleased to lend our support on this prestigious project. 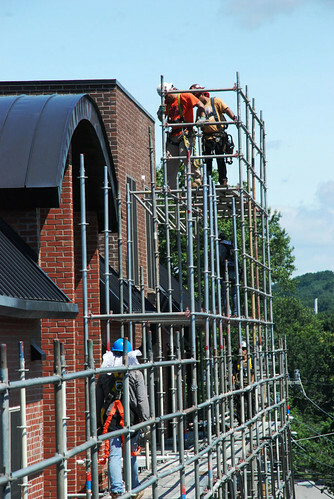 We erected a system scaffold complete with debris netting so crews could do repair work to the top portion of the masonry wall. 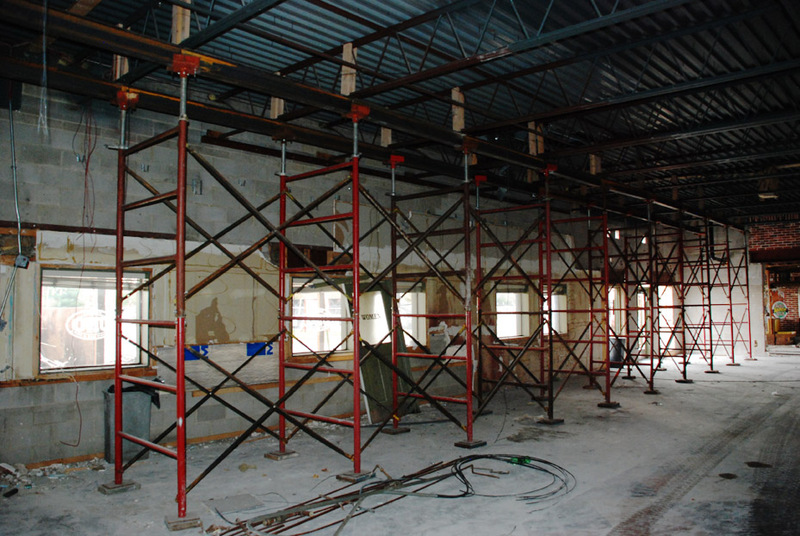 The key here was to leave one set of doors accessible so they could remain open during the construction. 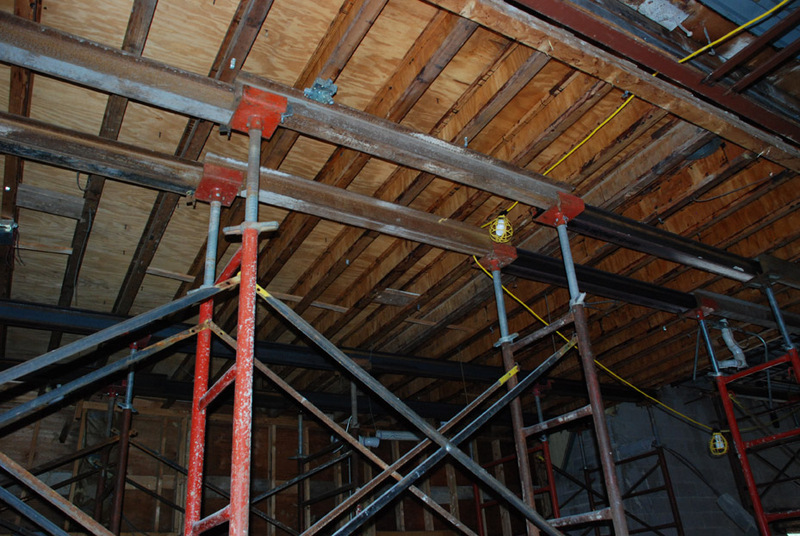 We specialize in working on historic buildings and structures and this was no different. We always take great care in and around the project we are working on. 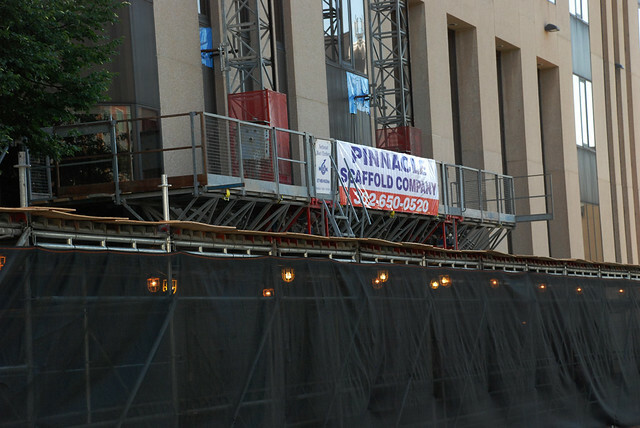 Feel free to visit www.pinnaclescaffold.com and see some of our work. You can call (302) 766-5322 to get an estimate on your next project. 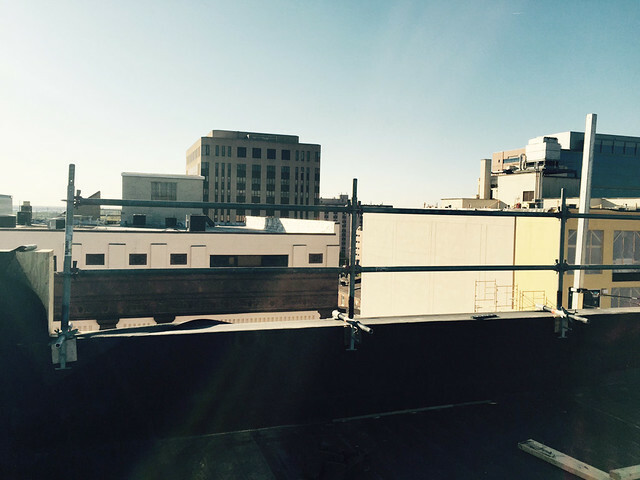 Pinnacle Scaffold was called in to this project at 627 N. Market St. to provide both overhead protection and a new guard rail system on the roof. 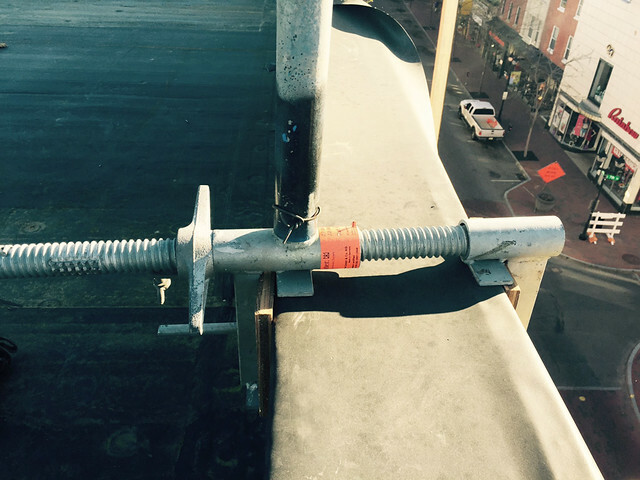 This isn’t just an ordinary guard rail either – it’s actually the first of it’s kind – with a clamp that grabs the top of the parapet wall and allows us to use system scaffold to provide a guard rail on the top of the parapet. This new system is different than the old slab grabber that clamps from the side; this new crabber clamp does the job by mounting on the top of the slab. 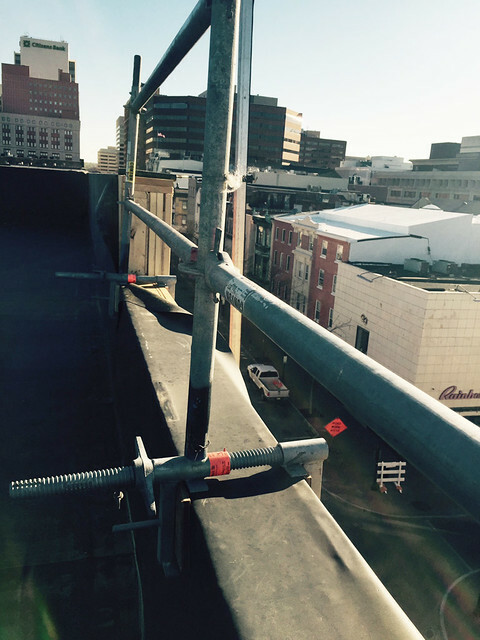 The guard rail was installed to provide protection for the people working on the roof where they added an entire floor to the top of the building and also put on a new roof. 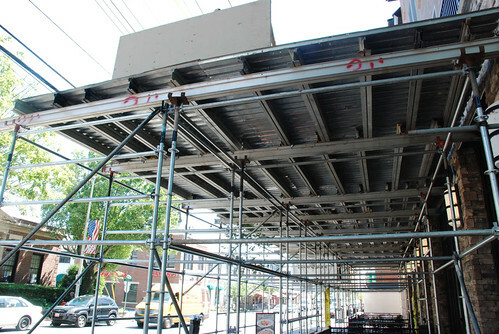 At the street level, PSC provided a canopy (sidewalk overhead protection) down the entire front of the building. 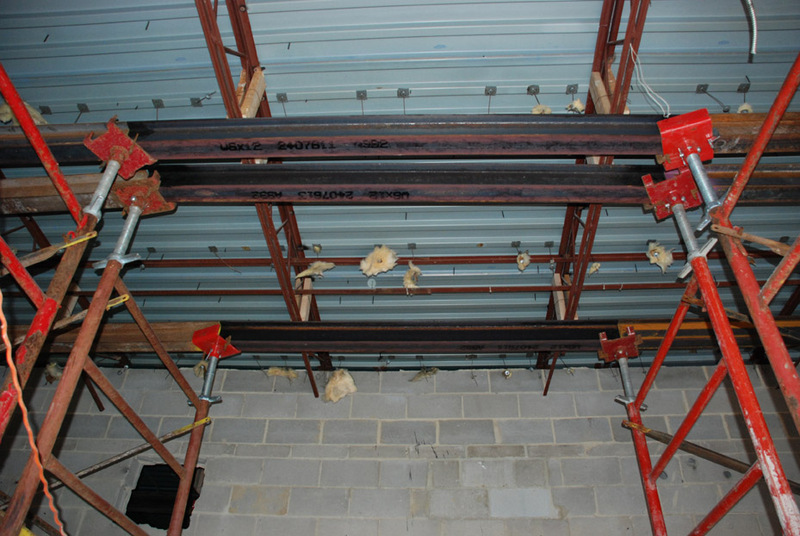 The canopy was engineered to hold multiple disciplines on top allowing access to the façade. 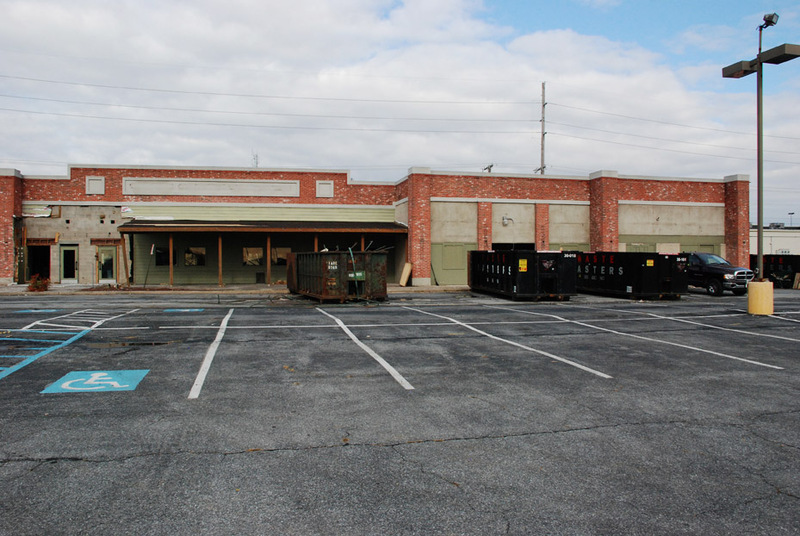 This building was a former store front that housed 4 businesses. It’s being converted into 46 one bedroom apartments, three studios and three two bedroom units. 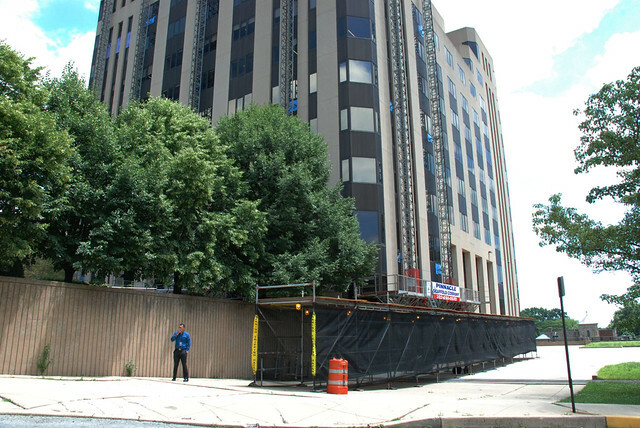 After the reconstruction of three floors and the addition of a fourth, the 47,000-square-foot building is to reopen in June 2015. 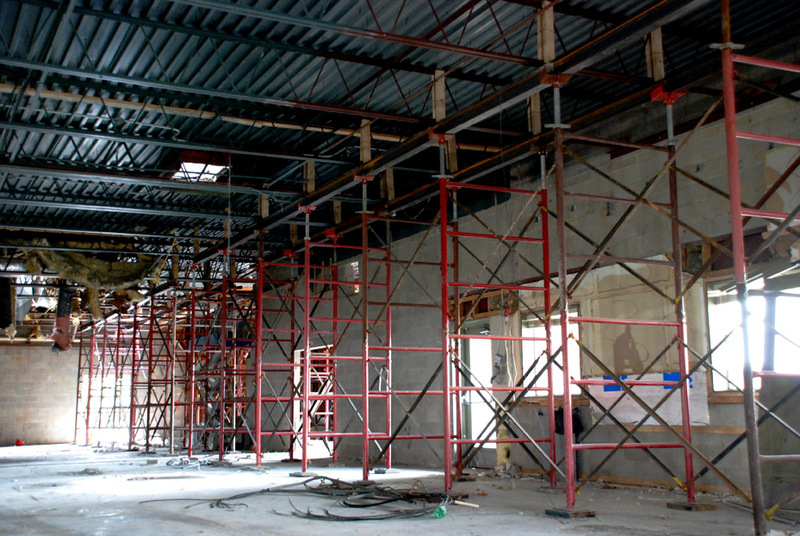 The $7.5 million project is being built by Buccini/Pollin. Pinnacle is proud to be a part of this prestigious project. 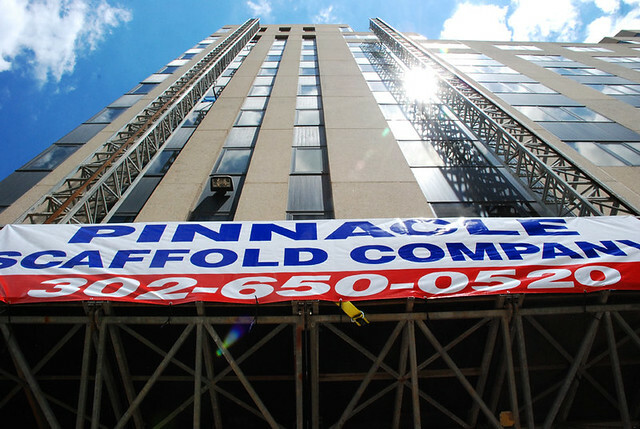 For all of your scaffolding, scaffold needs call Pinnacle Scaffold today at (302) 766-5322 or visit www.pinnaclescaffold.com for more information. Access, Lift & Handlers (ALH) Magazine shout out for Winterthur Job! Pinnacle Scaffold is featured in the June issue of Access, Lift & Handlers Magazine for the work we did at the Winterthur Museum in Wilmington, DE. It was a giant challenging job. You can read all about it here. A huge shout out to Lyndsey at ALH Magazine for writing such a great piece. Click on the photo to read all about it at our website. We will have more jobs coming so check back.